CREATE-A-DASH was created for those of you who are looking to build a custom digital dash and love the look and accuracy of Intellitronix gauges! Featuring our signature bar graphs for speedometer and tachometer, all gauges come on separate circuit board allowing you to position them just the way you want it. A generous size backing board and smoke plexiglass piece are included! Just cut to size to fit your existing factory or aftermarket bezel. Here’s how it works, each kit comes with an ABS plastic back panel to mount gauges on, a set of 6 gauges (oil,volt,temp and fuel), speedometer and tachometer. Kit also includes tinted Plexiglas sheet, mounting hardware and sending units. You can cut , mount and arrange gauges to match your factory layout on just about any vehicle. As with all our gauges you will get additional features such as Recall, 0-60 and ¼ mile ET, high speed recall and more. 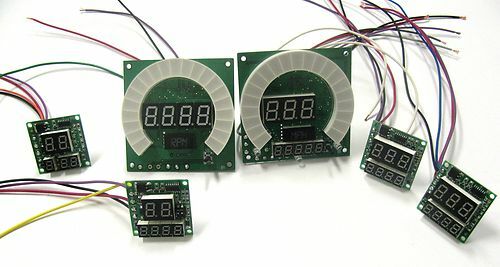 The Speedometer and Tachometer boards are 3 1/4” x 3 1/4” and the Oil Pressure, Voltmeter, Water Temperature and Fuel Level boards are 1 5/8” x 1 5/8”. The panels “black out” when turned off for a smooth, clean look. Included textured ABS plastic and Smoke Acrylic sheet are 12" x 24" x 1/8"